​and is used by career counselors around the world. When you take the assessment, expect to spend about ten minutes answering questions about the kinds of work activities you like or would like to try. R - Realistic interests relate to doing. People with this interest like to work with things, use tools to build or fix things, play sports and be physically active. They prefer outdoor activities. They are often good at electronics, mechanics, engineering, lab work, farming, or carpentry work. I - Investigative interests relate to thinking. People with this interest like to work independently, and like math or science. They may enjoy analyzing data. They like to solve puzzles and figure out difficult problems. They also enjoy reading, investigating and research, or using scientific or computer equipment. A - Artistic interests relate to creating. People with this interest like to work in unstructured situations where they can use creativity and come up with new ideas. They enjoy performing, creating visual arts or going to museums. They may attend concerts or plays, enjoy fashion, creative writing, or drawing. S - Social interests relate to helping. People with this interest like to work directly with people. They prefer teamwork and sometimes lead or coordinate activities. They enjoy teaching, counseling, communicating, or curing others. They may like to work with a special group like children or the elderly. E - Enterprising interests relate to persuading. People with this interest like to start new projects and make decisions that affect others. They enjoy influencing, persuading, and performing for other people. They often excel at selling things, promoting ideas, and managing people. C - Conventional interests relate to organizing. People with this interest like to make sure systems and projects work efficiently and effectively. They like structured situations with goals, deadlines and instructions. They are detail oriented and enjoy working with data, and may like to create reports. ​​How much education, training, and experience do I need to do the job? 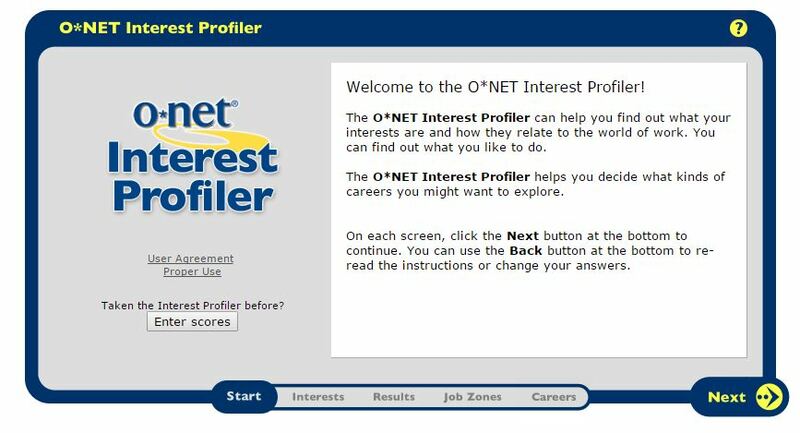 Each O*NET career is in one of five Job Zones, which are groups of careers that need the same level of experience, education, and training. Different careers need different amounts of preparation. 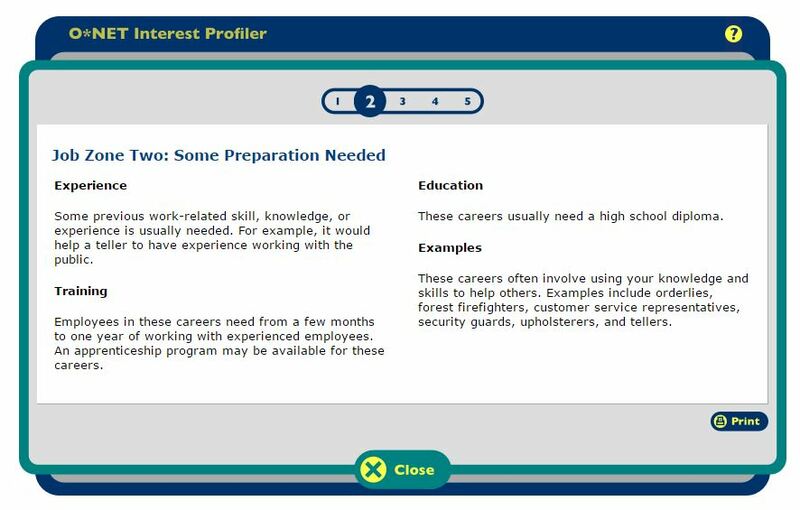 ​the Interest Profiler will help you identify and explore careers that might be right for you.